An estimated 185,000 students walked out of their classrooms this week to demand action on gun violence, a month to the day after a gunman killed 17 students and teachers at Marjory Stoneman Douglas High School in Parkland, Fla. Around 3,100 schools, from Philadelphia to Atlanta to Louisville to Seattle, participated in the demonstrations, which lasted 17 minutes—one minute for each of the Parkland victims. 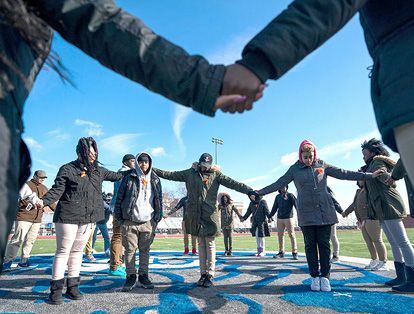 At Cooper City High, near Parkland, students gathered around empty desks outside and released doves; in Newtown, Conn., demonstrators recited the names of victims of gun violence. Thousands of others demonstrated outside the White House, chanting “Hey hey, ho ho / The NRA has got to go!” Max Poteat, a North Carolina student, said he was deeply moved by the protests. “It really hit me that these were teenagers just like us and that their lives were taken,” he said. 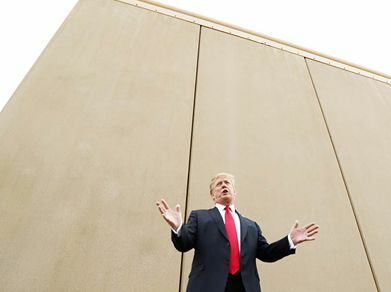 President Trump made his first official trip to California this week, traveling to San Diego to inspect eight wall prototypes in order to “pick the right one” for the U.S.-Mexican border, he said. Trump made several jabs at Democratic Gov. Jerry Brown, saying he was doing a “very poor job…. The place is totally out of control.” Days before, a spokesman for U.S. Immigration and Customs Enforcement, James Schwab, resigned, accusing the Trump administration of using “misleading facts” to attack Oakland’s mayor over her interference in an immigration sweep last month. Attorney General Jeff Sessions had accused the mayor of letting hundreds of “criminal aliens” escape arrest; Schwab said ICE had actually arrested 232 people—more than expected—and that it was “just wrong” for Sessions to suggest that all those targeted were threats to public safety. Austin residents were on edge this week after authorities said three deadly package bombings in the city were linked—raising fears of a potential race-related campaign of violence in the Texas capital. All three explosions involved packages that were left on the victims’ doorsteps and exploded upon opening. The first, on March 2, killed Anthony Stephan House, 39, the African-American stepson of Freddie Dixon, a former pastor at a historic black church in Austin. Dixon is friends with the grandfather of the second victim, Draylen Mason, 17, also African-American, who died in a bombing this week. Hours later, a Hispanic woman was injured in a third attack. Investigators believe the same person is behind all three bombings, but said it was too early to know whether they were motivated by racial hatred. The incidents involved “very powerful devices” that required “a certain level of skill” to move, police said. 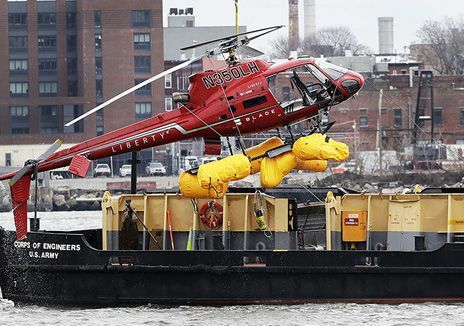 A tourist helicopter plunged into New York City’s frigid East River this week, killing everyone on board except the pilot. The Liberty Helicopters chopper was carrying five sightseers, ages 26 to 34, when it suddenly dived into the water and tipped upside down. Pilot Richard Vance, 33, was able to free himself and swim to safety, but his passengers were tightly harnessed and trapped in the submerged aircraft. Victims had to be cut from their seats when emergency responders arrived on the scene. Vance said one of the passengers’ bags might have inadvertently hit the Eurocopter AS350’s emergency fuel-shutoff button during the flight, causing engine failure. The crash was the third for Liberty in 11 years, prompting Sen. Chuck Schumer (D-N.Y.) to call on the FAA to suspend the company’s operating certificate. “Three crashes is too many,” Schumer said. 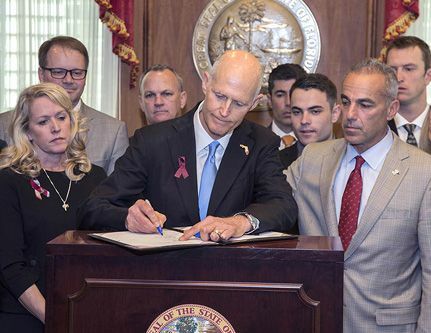 Scott signs gun bill into law.